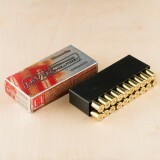 .45-70 ammunition is a former military cartridge developed by the US Army and used in the "Trapdoor" Springfield Model 1873. Effective against man-sized targets out to 300 yards, the .45-70 was a powerful cartridge for its time and was used in both rifles and Gatling guns. 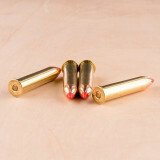 .45-70 cartridges fire heavy 300 or 400 grain bullets at muzle velocities in the 1,500 to 2,000 feet per second range. This gives them excellent close-range performance but significant drop-off at a distance. As a result, modern use of this caliber typically involves hunting in areas with dense vegetation; in these environments, the .45-70 can be used against everything from deer and hogs to bears. Despite its length, the .45-70 has also been used in revolvers such as the Magnum Research BFR. Shooters of these "hand cannons" must be steady-handed and strong of wrist! 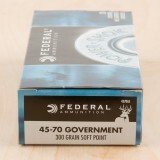 The 45-70 Government is a massive round with incredible power, capable of taking down even animals on the African Safari, depending on the specs. Gaining publicity through use in Jurassic World to take down dinosaurs, the 45-70 Government is just the round for you. Developed in 1873 by the United States government, this round was used for years in the American military and for over a century for hunting and range use, proving itself to all. Since the end of World War Two, Hornady has been dedicated to providing some of the best ammunition America has to offer and has more than succeeded, producing some of the most effective rounds on the market for all types of shooting uses. 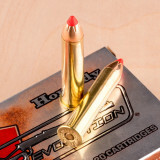 These Hornady LeveRevolution, 325 grain, FTX, brass cased, boxer primed rounds fire at 2050 feet per second with incredible power and hit with phenomenal expansion and penetration, making your next deer hunting trip a breeze. The 45-70 Government is a fantastic vintage round from 1873, capable of producing incredible results. 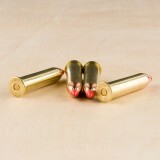 Developed by the United States Government, this amazing round can bring down some of the biggest game at close range. 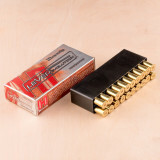 Federal has been around since 1922 and makes some of the best ammunition in the nation. Their American made products are reliable and deliver consistent performance whether you are on the range or in the field. 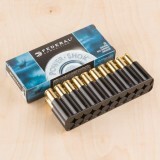 These Federal Power-Shok, 300 grain, soft point, brass cased, boxer primed rounds fire at 1850 feet per second and hit with massive energy and offer controlled expansion. The Power-Shok line is designed to deliver the terminal performance required for successful hunting application without a huge price tag.. 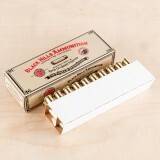 Whether you're toting a Marlin Model 1895 into the woods or carrying a Magnum Research BFR as a backup, these .45-70 Govt rounds from Black Hills will put some bite behind your big bore bark. 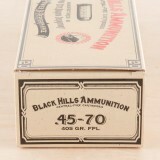 Black Hills ammo is manufactured in Dakota and has been loved by the shooting community since the company's birth in the 1980s. They've built a stellar reputation for exacting specifications in service to big game hunters, high-volume competitors, and military snipers. 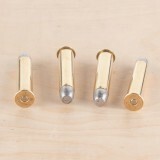 This particular ammo is from their Authentic Cowboy Action lineup and, like all of their brands, receives attentive inspection before leaving the door. Each round features a heavyweight 405-grain lead flat nose (LFN) projectile that is loaded to travel at 1,250 feet per second; this lends the round light recoil which is appropriate for match purposes. The projectile is contained within a reloadable brass casing which also hosts clean-burning propellant and a non-corrosive Boxer primer. The flat nose bullet does well to create proper circular holes in paper targets for easy zero confirmation at the range while the bare lead material does offer limited expansion into medium-sized game targets with thin skin. 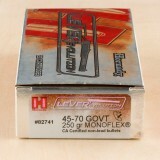 If you want a powerful cartridge that you can use in you lever-action rifle, order this 20-round box from Hornady. 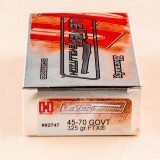 You’ll have .45-70 Government cartridges that are consistent and reliable, delivering smooth feeding and accurate shot placement to your shooting sports. Thanks to an innovative Flex Tip bullet and LEVERevolution design, these cartridges maintain superior feeding with excellent ballistics. 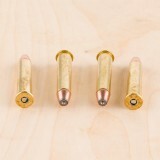 When these cartridges are fired, the 250-grain bullet comes out of the muzzle with a velocity of 2,025 feet per second and a hammering energy of 2,276 foot pounds. Even when the bullet reaches 300 yards, it still has a speed of 1,071 feet per second and 636 foot pounds of energy. Hornady is one of the nation’s most popular ammo manufacturers. Since 1949, this innovative company has been creating world-class bullets for American gun-owners. 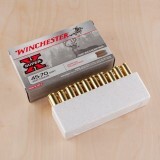 Although they started with big-game hunting bullets, they now make whole cartridges for a wide range of purposes. 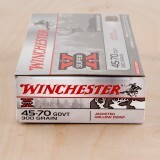 Load up your favorite rifle with these .45-70 Government rounds from Winchester and you'll be all set for all the elk, black bear, and similarly sized game that you can handle. Winchester's ammunition is supported by over 150 years of experience during which they have created some of the most influential calibers and firearm actions on the planet. Their Super-X line aims to provide hunters with ammunition that is as effective as it is affordable. Each of these rounds is crafted using a reloadable brass casing fitted with a non-corrosive Boxer primer and filled with Winchester's own special blend of propellant. 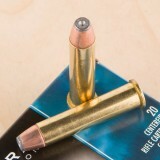 The load is crowned with a massive 300-grain projectile with an exposed lead tip which bears a precisely cut hollow cavity; this construction allows for incredible expansion during entry which is expertly retarded by a strong copper jacket and a toothed cannelure at the bullet's crimp point. The sum of these features is a round that will punch straight through thick breastplates and shoulder bones while retaining weight, mushrooming outward, and delivering game-dropping energy to vital areas in order to drop game animals without undue suffering. 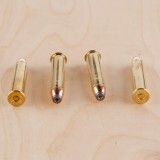 The cannelure also serves to keep the bullets in place under recoil for the preservation of accuracy. 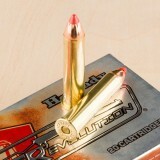 This 45-70 Government cartridge from Hornady’s LEVERevolution line of ammunition features a 325 grain FTX projectile. The FTX’s ballistic coefficient is stellar thanks to its pointed elastomer tip and its secant ogive projectile, so it delivers the accuracy and flat trajectory you need to take your game from afar. The bullet’s tip wedges deep within its high antimony lead core upon impact, initiating rapid expansion which is controlled by the bullet’s specially engineered jacket. This bullet’s InterLock ring soundly locks the core and jacket together during penetration, assuring weight retention that permits the FTX deliver up to 40 percent greater energy than a traditional flat point bullet could provide. 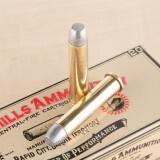 This round’s Flex Tip makes it ideal for use in lever action rifles, as it virtually eliminates the chance of a dangerous magazine misfire occuring. 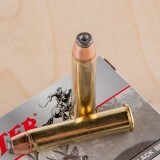 Its bullet’s enhanced ability to maintain its velocity over longer distances compensates well for its relatively heavy weight, making this a worthy hunting cartridge. Thanks to Hornady’s scrutinous quality assurance program you may take heart that each of these 200 cartridges will behave exactly like its brothers.